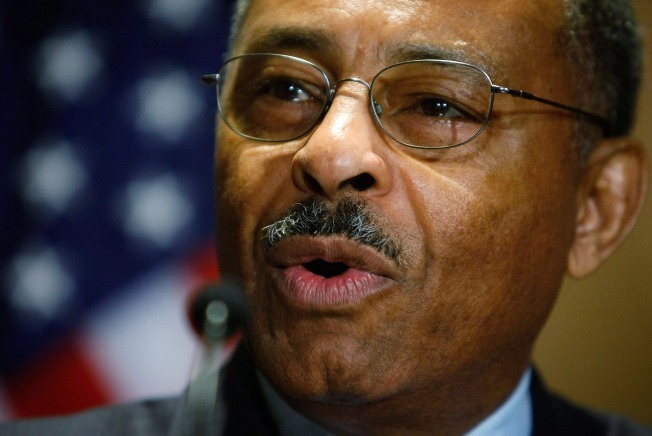 NBC Chicago and the Chicago Sun-Times confirmed through sources that Sen. Roland Burris met with federal investigators Saturday. U.S. Sen. Roland Burris left his Chicago home without speaking to reporters for a second day this weekend, even as the calls for his resignation continue to mount. Burris would say only "good morning" to the reporters asking questions outside his South Side home Sunday before he hopped into a waiting vehicle. Burris spokesman Jim O'Connor has said the senator has only private events scheduled this weekend. Just after Burris left, a Republican candidate for the 5th Congressional District left a letter at Burris' home calling on him to resign. Jon Stewart told reporters the letter asks Burris to step down by the end of the day. Meanwhile, the Better Government Association, a nonpartisan government watchdog, is also asking Burris to leave office. Just one day earlier, the embattled senator spent several hours talking to federal investigators, sources told NBC Chicago and the Chicago Sun-Times. Burris reportedly discussed the on-going federal probe into whether former Gov. Rod Blagojevich sold President Obama's senate seat. Sources say the meeting was held at attorney Timothy Wright's office in downtown Chicago. Burris is not accused of any wrongdoing and has said repeatedly he has no plans to resign. "I know for a fact that he's not a target of any investigation," Wright told the Sun-Times. The U.S. Attorney's office and FBI are reportedly interested in Burris' contacts with the former governor, his aides and his brother Robert Blagojevich and whether or not any fundraising was done in exchange for the senate appointment. A U.S. Senate ethics committee has started an investigation. O'Connor has repeatedly denied reports that the senator might resign. In fact, he said Burris is planning to return to the nation's capital on Monday or Tuesday. "There have been no discussions on that, and he's anxious to get back to work in Washington," O'Connor told the Sun-Times. On Friday, Illinois Gov. Pat Quinn joined fellow Democrats calling for Burris' resignation, while the White House urged the senator to take the weekend to consider his future. Questions still remain about the possibility of Burris being charged for perjury for lying to the Illinois House impeachment committee. The senator could face that charge if he lied under oath on Jan. 8 when he didn't fully disclose contacts he had with Gov. Rod Blagojevich or his advisers before he was appointed to President Obama's former Senate seat, legal experts say. A crucial piece of evidence could be on the FBI wiretaps that led to now-pending fraud and bribery charges against Blagojevich, who appointed Burris on Dec. 30 and was booted out of office just a few weeks later. Burris's testimony Jan. 8 before the House impeachment committee is under fire. He has been saying he "was not given the opportunity" to mention certain conversations because the questioning was fast-paced and the questioners changed the subject frequently. The senator's first statement about his relations with the Blagojevich administration before his appointment came in an affidavit presented to the impeachment committee. He said he had no contact with anyone about the seat until Blagojevich attorney Samuel E. Adam approached him about it. Under questioning by state Rep. Jim Durkin, R-Western Springs, Burris also told the panel that he had spoken with some "friends" and Lon Monk, a lobbyist and former top aide to Blagojevich. But a fresh affidavit dated Feb. 4 said that even before the election, the governor's brother, Robert Blagojevich, asked him to raise funds. And in one of two phone calls between them after the election, Burris said he told the brother he couldn't raise funds for the governor because he was interested in the seat. Then, in Peoria on Monday night, he told reporters he had tried to raise money for Blagojevich but had been unable to do so. "I think all of us believe that Roland Burris lied before the committee and we should not just shrug our shoulders and say that's bad and let it go," Durkin said.